A mock-up of the vehicles that will run on our new light rail lines. Less than two weeks ago, Metrolinx announced that the TTC would have no role in operating or maintaining the four new light rail lines—Eglinton-Crosstown, Finch West, Sheppard East, and the revamped Scarborough RT—city council recently, and in defiance of Mayor Rob Ford, revived. Instead, the entire project would be tendered to the private sector. Bob Chiarelli, minister of transportation, dissed the TTC, saying, “There have been TTC projects that have been long overdue and sometimes much over budget.” On the new lines, in effect, the TTC’s job would be reduced to opening the doors at connecting stations. 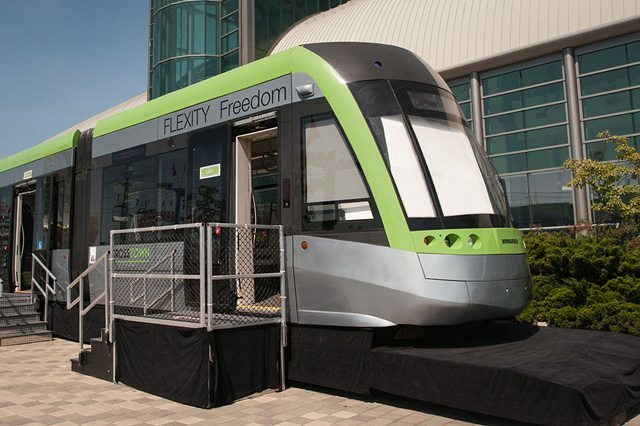 Yesterday, Metrolinx and the TTC announced that the TTC will operate the new lines after all. A joint press conference with Chiarelli, Metrolinx CEO Bruce McCuaig, and TTC Chair Karen Stintz overflowed with talk of partnership, sharing, and new milestones for their respective agencies. Smiles all around. The family spat between Metrolinx and the TTC appears to be over for now, but “partnership” is hardly the word to describe the result. The transit projects remain firmly in Metrolinx’s hands, with the TTC taking a junior position like a boy who gets to play with daddy’s train set. The original “DBFOM” arrangement (design, build, finance, operate, and maintain) would have given almost cradle-to-grave responsibility for the lines to a private consortium for almost every aspect of the LRT projects. The TTC had actually endorsed this scheme in a letter to Metrolinx. Why? They did not want to operate something without control over construction and maintenance standards, especially for safety-critical systems. This concern has evaporated with an agreement that the TTC will contribute to the specifications. Regarding the “F” in that list, accounting rules dictated by the provincial auditor require that Metrolinx retain “demonstrated control” of assets carried on provincial books. This magic lets Ontario hide some provincial debt, and gives cover for a takeover of Toronto’s transit projects. Most of the cost will be paid by the Ontario government, with about one-eighth coming from the private sector. In short, private sector involvement notwithstanding, most of the financing remains on the public books, and the assets remain in public hands. Anything to do with building, maintaining, and eventually refurbishing those assets must be done by Metrolinx or its agent, a private contractor. Chiarelli skipped any mention of the TTC acting in this role. One might ask why Toronto must wait so long to achieve what boosters once claimed as the city’s natural state, and why such world-class excellence does not pervade the TTC today. Transit riders will wind up with a “seamless” trip paid for with a single fare, according to Chiarelli. How the operating costs and subsidies might be arranged between the municipality and the province remains for future talks—and the target for an agreement on this is conveniently far off in the future: two years before opening day. Few of those speaking at the press conference will still be around to garner praise or blame when that time comes. When the province cut out the TTC two weeks ago, Karen Stintz declared that no subsidies would flow from the City of Toronto to Metrolinx to pay for a line that the TTC did not operate. That condition is no longer an issue, but a question remains about what incremental costs Toronto and its transit riders will bear as a result of the new light rail lines. Stintz mentioned that there will be some avoided costs for Toronto—LRT will replace bus lines and the aging Scarborough LRT—and by implication, some money will be available to pay for the new service. Any new major transit facilities will push up net TTC costs regardless of who builds and operates them. Toronto already saw this with the Sheppard subway, and the TTC expects the Spadina subway extension to lose money from the day it opens. Greater operating subsidies, higher fares, or service cuts must compensate for the higher cost of more frequent, faster trains and dedicated infrastructure. Whether a private operator looking to minimize costs and maximize profits will provide cheaper maintenance than the TTC is anyone’s guess, and it will be a decade before there are any comparative data. Two studies-in-progress look at possible sources of revenue to finance transit expansion and operations. The City of Toronto has just published an overview of transit funding options [PDF] and plans to take this on the road to Torontonians in a public consultation process. Metrolinx has its own forthcoming investment strategy, a study of how to pay for the provincial “Big Move” plan (a substantial portion of which is made up by Toronto transit projects), due out by June 2013. McCuaig observed that the public is “in some cases ahead of us” on the funding question, while Chiarelli cooled expectations on that front saying that once published, the Metrolinx proposals would have to be weighed against public input. Political courage about any new funding (read: taxes) will be limited by the delicate condition of the Liberal minority at Queen’s Park, who may not even be in power by the time Metrolinx’s investment strategy hits the streets. In coming months, Toronto City staff will have the thankless job of conducting a consultation about transit funding and planning while the mayor and his supporters are adamantly opposed to any new taxes. (Rob Ford rejected the revenue tools listed in the City report just yesterday morning.) A coordinated push to build support for better transit funding can’t even get out the door at City Hall. With the TTC operating the new LRT lines and a separate maintenance company working for Metrolinx, there will be pressures to shift expenses between the municipal and provincial partners. Chiarelli emphasized that interest on the capital debt, itself an “operating cost” on provincial books, would be carried by Queen’s Park, omitting to mention that such interest has never been treated as a transit contribution in the past. With this attitude, Toronto should not hold much hope for better operating subsidies. Politically, a fight between Queen’s Park and Toronto is in nobody’s interest, especially with the provincial reputation for sound project management under daily attack. Better to find some common ground, to get on with actually building transit infrastructure, and, in the distant future, operating new services. This announcement gets past the most recent transit crisis, but more are sure to come as municipal and provincial agencies and politicians wrestle over the details in these multi-billion dollar projects.